It is December, the last month of 2015. As the end of the year comes closer, LdM students are getting ready to go back home. However, December is one of the most beautiful time to be in Florence! To make your last days more memorable, LdM news came up with a to do list, Must Do’s in Florence, December 2015. “Contemporaneamente”, a series of lectures, aperitivo, conferences, concerts, and exhibitions about contemporary art and designs takes place from December 6th to 24th. The focal point of Contemporaneamente is Via Maggio, which is a street full of galleries and antique shops that runs from Santa Trinita to Piazza de’ Pitti. On December 5th, Via Maggio will be closed to traffic for a day long celebration of beginning of Contemporaneamente. A photo exhibition Bollywood Talkies takes place at Fondazione Studio Marangoni in Florence from December 5th to the end of January as a part of River to River: Florence Indian Film Festival. Bollywood Talkies takes us to a journey to cinemas in India with photos by an Italian photographer Vanessa Vettorello. The entrance is free. 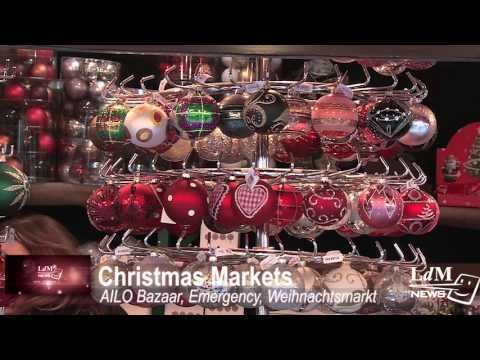 Of course, there are Christmas markets! American International League of Florence (AILO) holds an annual fundraising bazaar with handmade toys, jams, and painted goods and more. At Palazzo Medici Riccardi, there will be the Emergency Christmas market, where you can find sweets, gadgets, toys, and wines. Piazza Santa Croce also holds Weihuachsmarkt, a huge Christmas market with a lot of Austrian/German seasonal delicacies. You can enjoy performances of talented, young musicians thanks to Musica Blu. Musica Blu is an initiative for young generation musicians. A number of concerts will be taking place at Palazzo Lenzi from December 16th to 18th. On December 8th, the day of Immaculate Conception, there is a special celebration in front of the Duomo. Beginning with lighting huge Christmas tree beside the newly restored baptistery, there will be parades and evening light shows. Last but not the least, an art exhibition Abstraction and Reality takes place at Accademia delle Arti del Disegno from December 9th to 30th. Abstraction and Reality is an personal exhibition starring works of a contemporary Chinese painter, Wang Hongjian. Capturing the most vulnerable moment of human, his works are known for its social consciousness and a sense of humanism.